Italian Language edition: Based on two walks, this guide takes in all the best on offer in Scotland's capital city - history, romance, culture and tradition mixed with 21st-century sophistication and charm. Enjoy the Old Town's majestic Royal Mile, dominated by the grey fortress that is Edinburgh Castle, and the contrasting Georgian elegance of the New Town, enhanced further still by shops, restaurants, galleries and green spaces. 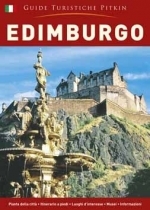 Discover, too, why visitors come from all corners of the world to revel in the spectacle of the Edinburgh festivals.